Punjab throughout the past ages, has been subjected to frequent aggressions and invasions. But during the short spells of peace and tranquility, the people of this region had the rare acumen of celebrating life in those brief transitory intervals of peace, giving rise to great creations in the domains of art and literature. Thus we find that the hands that lifted the sword when freedom was threatened took up the trowel, the brush, the chisel and the pen to create great treasures of architecture , art and literature, in an amazingly opposite swing of the same energy. In this article Shamsher Singh (Artist Phullan Rani’s husband), who is (was) a connoisseur and critic of art himself, and has written a number of books and brochures on it, traces the history of art in Punjab from the earliest to the modern times. [Ie strikes a hopeful note that Punjab is again getting ripe and ready to take a leap to scale the summits reached by it in the past. The land of Punjab is very ancient indeed. The fact of its being watered by five perennial rivers and its possessing a salubrious climate, has made it a rich and fertile land, plentiful in life’s elementary necessities. Therefore, it also looked very inviting to the hungry eye of the foreign marauders who entered its sacred precincts in order either to make it their permanent home or to ransack its natural wealth. Besides its natural wealth which satisfied physical needs, it had superabundance of scenic beauty which especially on its northern side with its lofty Himalayan ranges crowned with eternal snows, its immaculately blue horizons, its verdurous valleys resounding with enchanting streams, verged on the sublime. Such boundless wealth of beauty could transport even the most prosaic nature to the heights of lyrical ecstasy. Both these things material plenty and scenic wealth have, therefore, conspired together to biing out the best from whosoever came into contact with it for a longer durqtion or shorter period of stay. History bears it out that it has always been in the region of surplus wealth that man has sought an outlet for his genius in works of art, as the poet Rabindranath says, " The idea of art has its origin in the 'superfluous' i.e. when a person transcends the bounds of his immediate necessity, then alone can he turn his attention to that pure enjoyment out of which all art is born". Though the stupendous mountain chains in the north west of lndia, fostered a distinct type of civilization and culture, yet they never sufficed to shelter the sunny climes of Northern India from the inroads of ambitious monarchs or the wandering nomads. These invaders, one after the other stormed through the narrow defiles that pierce through the great rocky barriers that led into the plains of the interiors from the third millennium B.C. 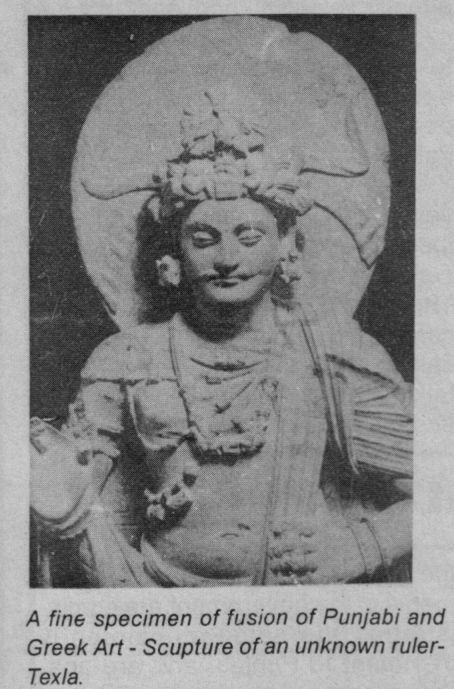 When the Dravidian civilization flourished in the North West of lndia, Aryans, Persians, Macedonians, Bactrians, Greeks, Scythians, Parthians and Kaushans, and lately Afghans and Mughals came in waves (with the exception of Macedonians whose conquest was only of a transitory character) and each one of them in turn left some indelible impression upon the art and culture, particularly this part of the country. The archeological excavations carried out in Mohanjodaro in the Larkana Distt. (Sindh) and Harappa in Montgomery Distt. of Punjab (both now in Pakistan) show that a highly civilized society flourished here and the art of architecture had reached a high degree of perfection. The superb relief figures of animals carried out on the seals, a few hundred of which have been discovered, exhibit a high degree of originality and excellence. The stone images at Harappa recall the perfect finish of the Greek statues and bear testimony to the great development in the sculpture art of even those in ancient times. 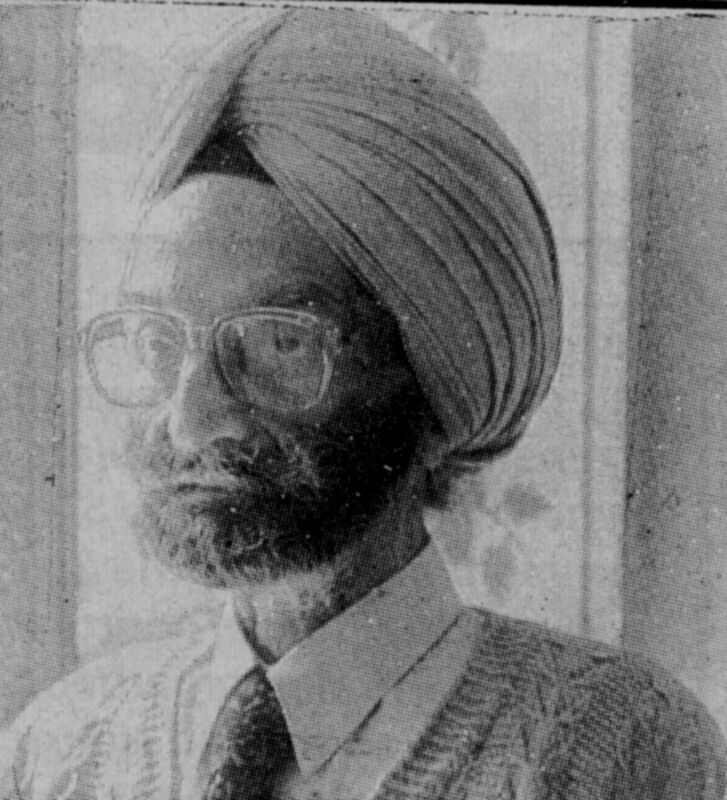 The lndo-Aryans, who later drove out the Dravidians, gave vent to their ,lyrical rhapsodies as a result of the deep impact of the majestic beauty of Punjab , in the form of hymns known as 'Rick Samhita' written in praise of various gods. Here again they wrote the Vedas, which as literature, have been unexcelled in their simplicity of diction, sublimity of thought and lyrical intensity. Architecture, too, made a considerable advance. There are references to mansions supported ?y a thousand columns and provided with a thousand doors. Mention has also been made of stone castles and structures with a hundred walls. The Mahabharat and the Ramayana, the famous lndian epics, according to indisputable historical evidence have had their birth in the great land of Punjab . Tradition further affirms that the Mahabharat was first recited in the city of Taxila. 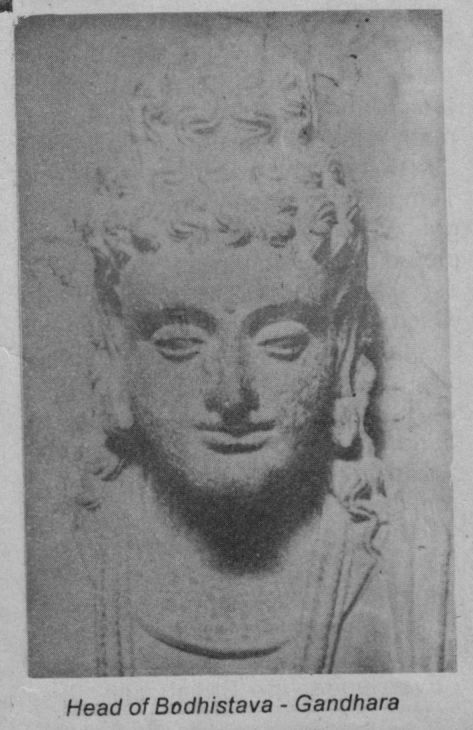 The excavations at Taxila, in Northern lndia, show mixed Persian and Greek influences on art. 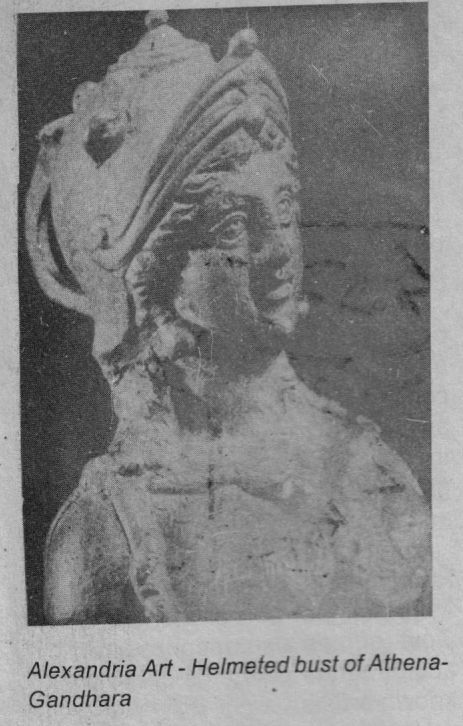 The fusion of Persian and Hellenistic idea took place in Bactria and the hybrid art thus evolved was introduced into India and manifested itself chiefly in the coinage and sculptures of the period. 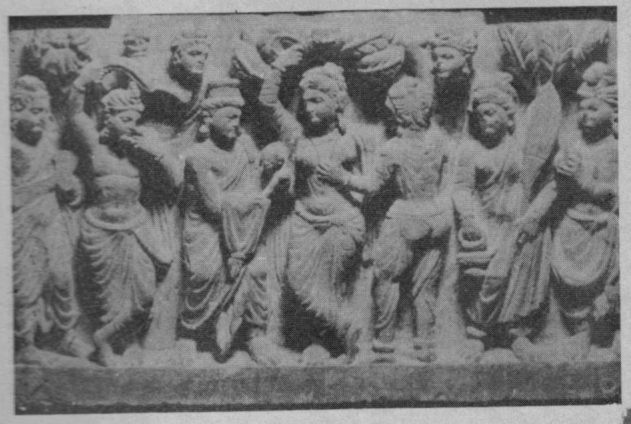 The wedding of the Hellenistic and the indigenous art brought about the existence of the Gandhara School of Art in the North West. 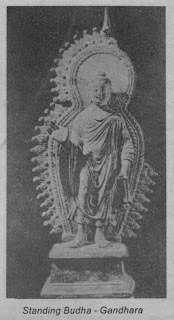 lt is generally regarded as the source of all subsequent development of art in India and spread through the Chinese Turkistan to the far East and influenced even the art of China and Japan, India particularly found in the formative arts, introduced ?y the Gandhara School of Art, a valuable medium through which to narrate in simple, universal language, the legends and history of her faith. There were beautiful temples and monasteries and the famous Tower of Kanishka at Purushpur (Peshawar) was one of the wonders of Asia. But all these have perished without leaving a?y trace behind. 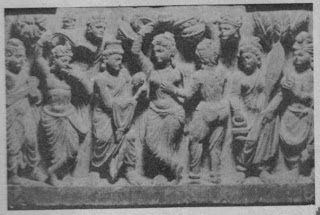 All this proves beyond dispute that all through the ancient times, even before history came to record its array of events, Northern India had been the home of many a virile race coming from beyond lndia's North Western frontiers and which contributed its best in the form of literature, sculpture and paintings to its rich heritage. From here, through the course of centuries, the fragrance of culture, enriched by time, spread far and wide into the interiors of India and finally became an integral part of her varied life. From the 11th century A.D. onwards it was the peculiar misfortune of the North West of India, particularly Punjab that it was subjected to the violent onslaughts of the barbaric hordes who, unlike their ancient predecessors, believed in the cult of fire and sword and annihilated everything of artistic value here, dubbing it all as heathenish idolatry. This period of spiritual darkness was partially relieved with the advent of the Mughals on the scene when, under the benign patronage of a few of its enlightened rulers like Akbar and Shahjahan literature, architecture and painting flowered once again into renewed beauty and charm. It was Northern India again, especially Punjab and Kashmir, that got the best of it. We hqve Shalimar Garden both in Kashmir and Lahore, and Jama Masjid in the latter ci?y as the best specimens of Mughal architecture. The poetry of Guru Nanak, Guru Ramdas, Guru Arjun Dev and other Sikh Gurus which came into being in those very days, is a spring of perennial charm which had its ennobling effect on the life, manners and literature of the people all over lndia. ln the domain of painting, the Kangra School of Art, uncorrupted by any exotic influence, owing especially to the peculiar nature and situation of that part of the country remained away from the path of the invaders and throve in un-tarnised glory. None can deny its strong individuality and growing influence on the present day art trends in the country. !t has been widely recognised that the people of Punjab are, by nature, individualistic, hardworking and colourful. They are born and bred in art. Therefore all their art activities, manifold as these are, diverted into these channels. 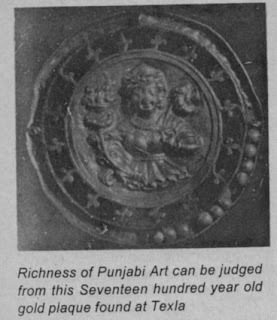 Draring the Sikh rule, which only for a brief space of time knew peace and security, art flowered into a thing of noble beauty. Under the patronage of the great Sikh monarch Maharaja Ranjit Singh, it saw many a magnificent structure rise to a true splendour. The Golden Temple at Amritsar, which was begun by Guru Ramdas, was completed by the Maharaja. lt is the finest specimen of Sikh architecture which blends in rhythmic balance the gardens of the Mughal architectural art with the typical grace of the Hindu Art. The summer palace of ' Maharaja Ranjit Singh at Rambagh situated at some distance away from the Golden Temple and built for the ladies of the Maharaja's harem to enable its members to visit the Temple in strict privacy, is a beautiful architectural work, which elicits the admiration of all art lovers. Even under the British rule, the United Punjab made rapid advances in cultural fields in spite of obvious handicaps. The excavations of ancient towns mentioned above revealed to the astonished world the rich heritage of the Punjab is. There was a sort of renaissance generated by these great ancient works belonging to the glorious past. This has also roused the dormant art instinct of the heroic and versatile people. 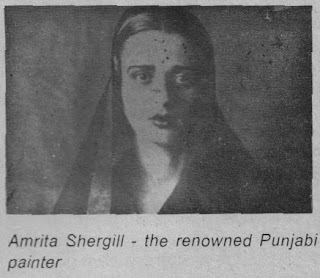 Soon at Lahore an art gallery came into existence, which sought to preserve the highest efforts of the Punjab i artists, both past and present, belonging to various fields. But unfortunately the division of the Country in 1947, made everything topsy turvy, and most of the art treasures were left behind in Pakistan. The Punjab on this side of India was deprived of a rich collection. 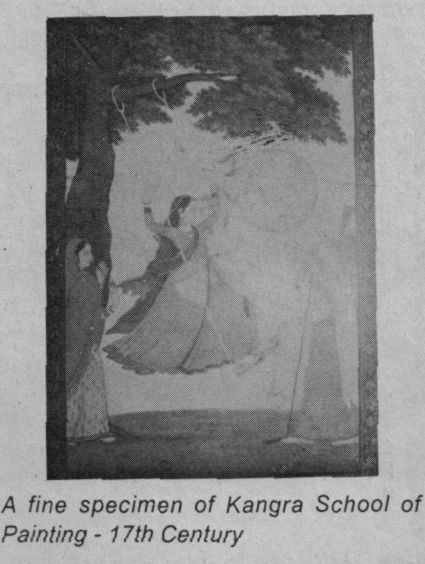 After the partition of Punjab , on account of a sudden upsurge of feeling of art among the intelligentsia of society, the subject of Fine Arts was introduced in the educational curricula in schools as well as in colleges and also many separate Art Colleges, sponsored by the Government sprang up. Art received further stimulus during the brilliant Chief Ministership of late Giani Zail Singh. A two year art and craft diploma was introduced in some of the leading schools of Punjab which turned out scores of brilliant art teachers who were absorbed later in various recognised educational institutions here. This received further impetus for learning Fine Arts among the students. lt has also been incorporated as a special subject at college level up to the Master's Degree. Since recent years various art studios have cropped up in several cities of Punjab which the art loving students join to study and learn the beauty and introduction of a number of art media. Further more art competitions are organised by various organisations all over the state and the brilliant competitors among the students are awarded prizes. This has given further fillip and encouragement to the growing trend of the popularity of art among the student community. The Universities and Colleges in Punjab and other public places like the Municipal Corporations and the Govt. offices also encourage art by acquiring the paintings of the well known artists..
Now there is also a full fledged Art College at Chandigarh which students eagerly join to avail themselves of the posts of Art Lecturers in various colleges in Punjab . Thus there is widespread revival of interest in various arts and the day may not be far off when this state would again achieve those pinnacles which it had reached in the past. Top MBA Colleges in India even have a tie-up with reputed corporations for the internship, wherein they knowledgeable lively example about the individual department that how to handle people and learn to control the people in the working culture which gives assistance in real implementation. 12th passed student always confuse for their future. Many courses are available for 12th passed students like arts, commerce, Science etc. They chose any course for their future. They can take any subject according their interest. Best courses after 12th Arts, Science best colleges for 12th passed students. 5. MBA is field that has wide scope in almost all countries...but the main reason is for future prospect. MBA is something that not only prepares you for job but for future day to day management also...You must choose the best college or University for MBA. Best courses after 12th Arts, Science top colleges in Mumbai. MBA is the master in business. This course has many subjects. Student can choose any subject. Accountancy, finance etc. every subject a good future. Top 50 MBA Colleges in India India has many top colleges in MBA. Credila Financial Services now finance problem for further studies is not a problem it will help you to solve this problem so now not to worry about the finance for further studies and freely do what you want to do. In this cut- throat competition time, everyone wants to stand on top, be on top. Companies are hiring and providing best in industry packages to MBA students. Top MBA Colleges in India are like factory to produce such capable students. If you have decided to go to US for your higher education, one of the important decisions to make is the period to apply. Generally, in the United States, there are two seasons for admissions. Fall Or Spring - When To Apply US Universities?